In the Rose Garden / Why, generally, penguins? We have a thread about why, specifically, they're penguins instead of meerkats or llamas or something. But why do they exist at all? Before she watched the last few episodes, bella asked me if they would "explain the penguins," which for some reason was the first time I thought of the penguins as a mystery that needed explaining -- but they surely are one. What purpose do the characters of the penguins serve in the story? What would we lose if they weren't around? What narrative problem do they solve? They originally had a Pinforce sticker on their box like the one Sanetoshi stuck on Momoka, but it peeled off to reveal a Pingroup sticker. Since Pingroup seems to be "society" (you can see Pingroup everywhere in the PD world) so maybe the penguins are supposed to be the "invisible" self for the Takakura kids + Masako. Not sure what to make of the Pinforce logo peeling off though - it might just represent that Sanetoshi sent them. Other than that though, I got nothing. I guess they're like modern day versions of Chu Chu, they seem to share the same purpose in the story, though they get more focus than he did. I guess they're like modern day versions of Chu Chu, they seem to share the same purpose in the story, though they get more focus than he did. Yeah... but Chu Chu was just put out there as something we had to accept. SKU is a world where there exists a tiny marmoset who likes eating cookies whole, and this is unexceptional -- deal with it. The penguins are different. They are introduced as mysterious and inexplicable, with supernatural characteristics that baffle the characters themselves; their arrival coincides with Himari's first resurrection, and they seem to be connected to Penguin Hat Lady. Chu Chu doesn't require explanation. The penguins do. Don't they? Ultimately, I think they're pretty analogous to Chuchu and the Shadow Play girls: they are symbolically significant but have no real explanation other than to serve as vehicles for audience insight. You don't need to understand Revolutionary Girl Utena to understand it. Maybe her penguin is different because she has her own separate curse from the Natsume clan. Kanba, Shoma, and Himari's penguins look alike, probably reinforcing the idea that they took on the punishment as Takakura. Interestingly, Coffinbreaker, the fact that you brought up Shadow Girls reminded me of C-Ko. For the duration of the Black Rose Arc, Utena responded to everything that C-Ko did. This was unique from the rest of the Shadow Girl experience, where A-ko and B-ko are more independent from the rest of the cast. Derailing into Utena for a minute there, Black Rose Arc was somewhat of a period of introspection for a lot of characters. A point where characters have their flaws presented before them, but probably didn't realize it (Because it's Utena who answered to C-ko, not any of the Student Council members or their respective shadow counterparts). Penguins seemed to interact a lot with the three siblings early on, when they aren't necessarily aware of their own sins and their "punishment". I guess it's kinda like the "us" and "them" mentality. The penguins are acting out the siblings' flaws as separate entities. So early on, the siblings could be looking at the penguins being silly and think that it has nothing to do with them, while not realizing that that is them all along. I noticed that it was when all 3 of them started to remember/acknowledge their sins and their punishment that they started interacting with the penguins much less, and the penguins were relegated to backgrounds. By then, they seem to be living their lives without realizing the penguins are there. So maybe, in a way, even though the humans and the penguins seem to be drifting apart, they've actually "united". Kinda like how even though our conscience isn't really a material entity, but it's still ringing in the back of our mind. SIDENOTE: The fact that Himari's photo ended up changing from penguins to monkeys could be an indication of "change" and "evolution" (humans evolve from monkeys), whereas penguins symbolize verge of extinction. I like this! It's like over the course of the series, they close themselves off more and more, even to the potentially very helpful penguins, because they carry the burdens of their punishments on their own shoulders. The penguins serving actually purposes fades out quickly and they begin to be more symbolic, SPG things...I just wonder if that was the intent all along, or if it was quickly figured out that they were too useful a resource for the characters to have, when part of the drama was that the characters had only themselves and their will to defend against the events in play. If the logical conclusion built from the first three or so episodes continued, by the end Kanba and Shouma would have been able to turn events to their advantage using their awesome magical invisibuddies, but that would have involved a level of scheming and a reduction in the overall drama of their plight. I guess it's kind of like if in SKU all the characters who dueled had actually carried around their swords, like knights or samurai. Then every dispute would have ended in swordfighting, instead of just most. Why now I imagine a SKU with illegals penguinfights in the suspended arena as shady ways for Akyo to gains funds from the bets? 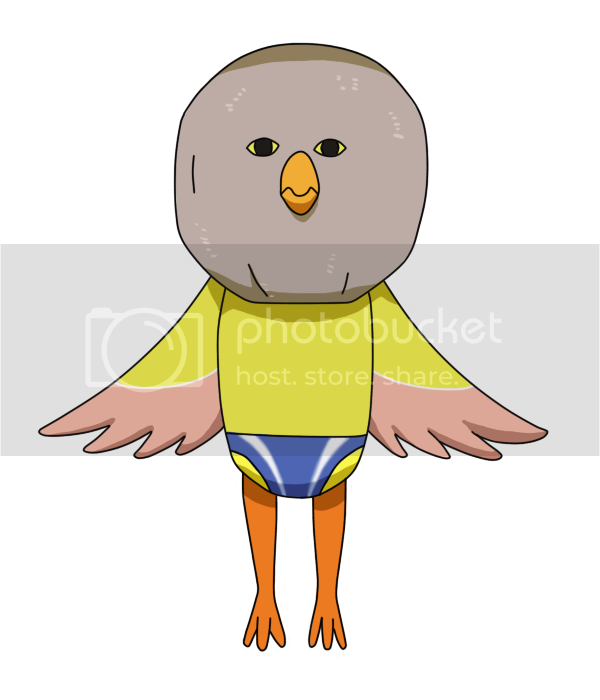 This makes me wonder, if Kanba's penguin is so lecherous, what would Akio's be like? I don't think Akio's "lecherous" the way Kanba is. At least, I don't think he lusts after people, that would mean that he's being controlled by that kind of desire, while in almost every instance, he seemed to be very much in control over the situation. At least he seems like he's in control, until that scene where he commented, "Must you torture me so," to Anthy. It was my mistake, actually is "Akio" with the "i"..and actually, I do LOVE how it was dubbed<3 as well like I do with the rest of the cast! And I'm very demanding and complaining in anime italian dubbing. VERY. But I totally looks the other things you saw, Giovanna, as well as the "Berlusconi likeness". 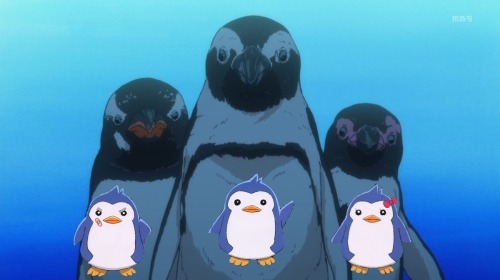 Okay, so there's something that DD said in the Evangelion thread that struck me, regarding penguins. Bear in mind that Ikuhara and Anno have been friends for decades, that Anno even tried to get Ikuhara to leave SM to come work on NGE. One of the writers for Eva, in an interview, is supposed to have said that removing Penpen towards the end of the series was a way to hurt and destabilize the audience without them realizing it. I really like that a penguin with a funny backpack is the emotional lynchpin that way. So, I think this is why the penguins disappear later in the show and why the tone changes so much. They walk funny, but cannot swim forever. In short, they are kind of stuck in a weird middle ground where they never quite fit in. Just like many of the characters, who have been rejected by society. Also, we've all seen March of the Penguins, that kind of devotion is very reminiscent of the the way Kanba, Shoma, and Himari characters are so closely knit. PS: I'm new here. Why are there four different masturbation-related emoticons? Isn't two enough? It's as good a theory as any I've heard, I s'pose. I think I've pretty much come around to the idea that Ikuni wanted a marketable mascot and found a way to shoehorn penguins into the show for that reason. I just can't find a point during Penguindrum's story where the penguins solve some kind of narrative problem that justifies their weight. The same is true of SKU's Shadow Girls, of course, but I understand what the Shadow Girls are doing. They don't have to influence the plot, because they are meta entities, the Greek chorus commenting on the plot. But if the penguins' purpose is entirely meta in the same way, it seems strange for them to be embedded into the plot as deeply as they are. I guess they don't impact the mechanics of the plot, but they do wonders for tone. So much so, that I think the show would be lesser witihout them. Besides Disarming the audience, it establishes the world as more explicitly magical, and their presence serves as a constant reminder of the Faustian pact made by the brothers. The fact that they're penguins and not crows or something keeps this as a not-so-dark reminder. If they were just a meta-presence then they wouldn't be as effective, I think. I'm rather late to the party but I think that the penguins were chosen at least partially for a much more prosaic reason. The Sunshine City aquarium around which so much of the story takes place has a very popular penguin show. Ikebukuro's iconic symbol is the owl but in a way it makes more sense to use penguins.